Don’t fret! The Lens Out Loud team has got you covered. 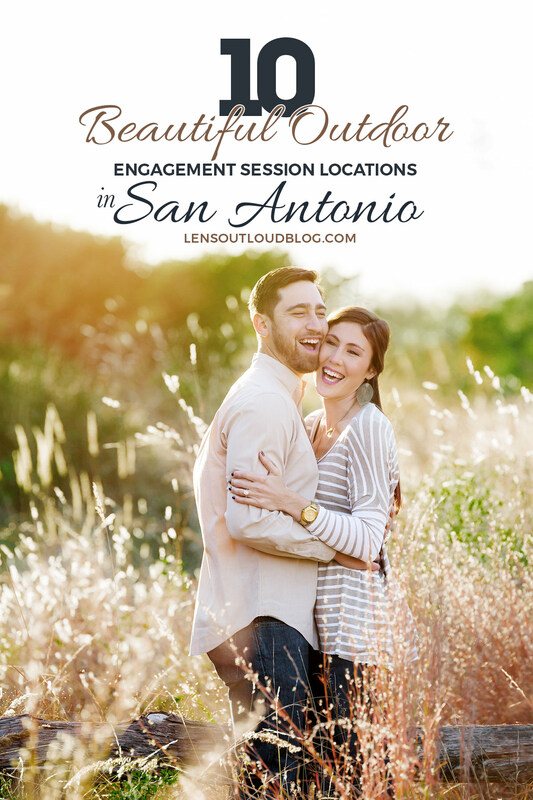 We’ve been photographing engagement portraits in San Antonio for brides & grooms since 2004- which means we know all of the good spots. 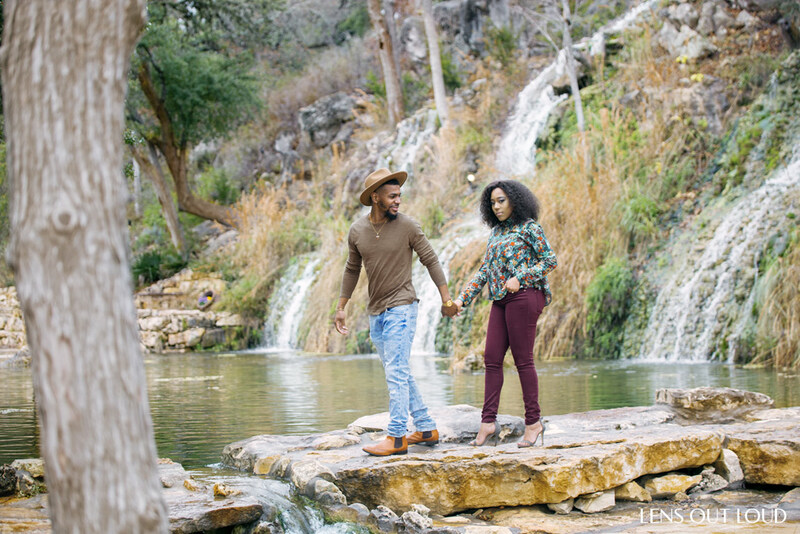 We’d love to share what we believe are the 10 of the best outdoor engagement photo locations in San Antonio, Texas along with a few honorable mentions and a pro tip you’re going love. 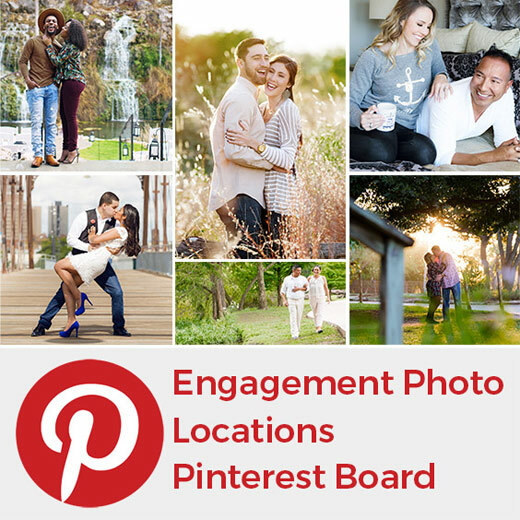 Don’t forget that you can check out more San Antonio Engagement Photo Locations on our pinterest board and right here on our blog, our Instagram and Facebook. Let’s get started! 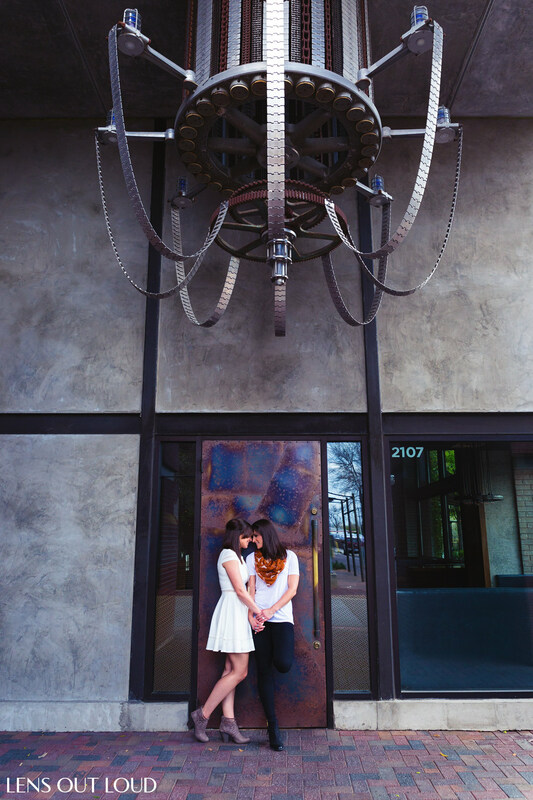 The Pearl Brewery is well established as one of the prime engagement photo locations in San Antonio. The Pearl features beautiful green spaces and urban contemporary architecture with an infusion of industrial design elements. 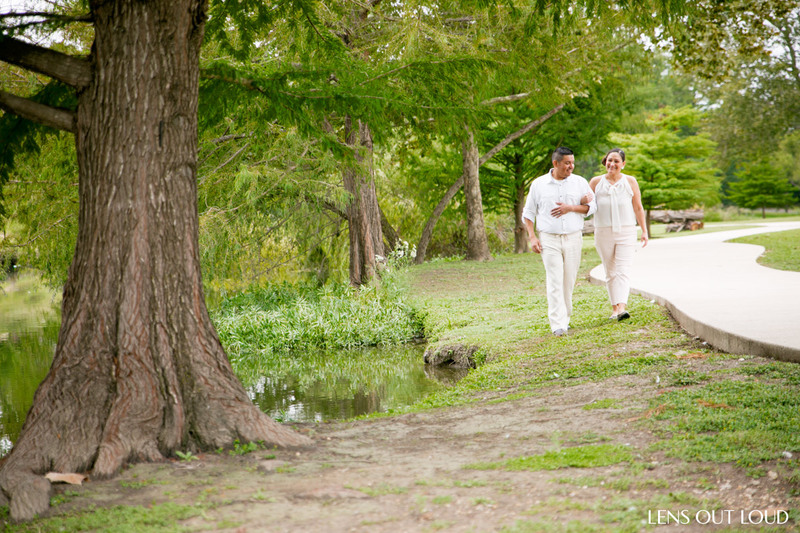 Kick things off with a candid stroll along the River Walk at La Gloria heading towards the riverside amphitheater. Then make your way up to the bridge. Afterwards you can head towards Hotel Emma and wrap up your session with carefree pictures of the two of you hanging out at the courtyards near Southerleigh, Cured and Local Coffee shop. 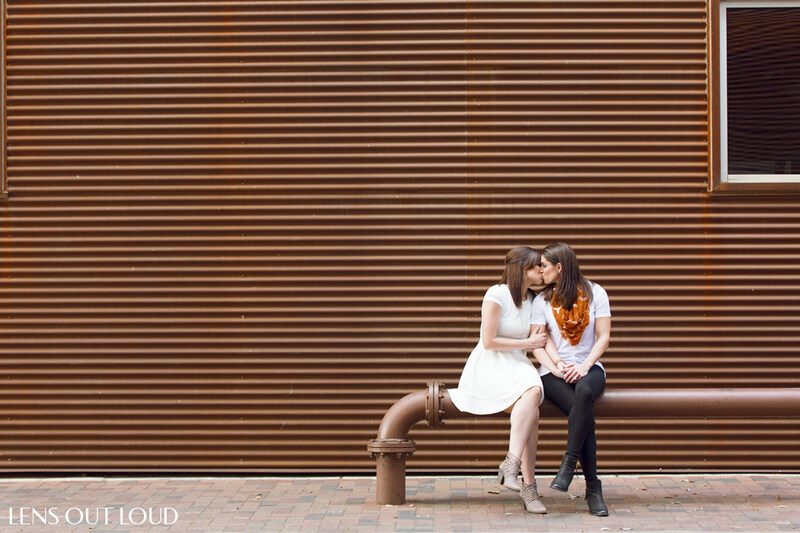 Here are a few images from one of many Pearl Brewery engagement portrait sessions. 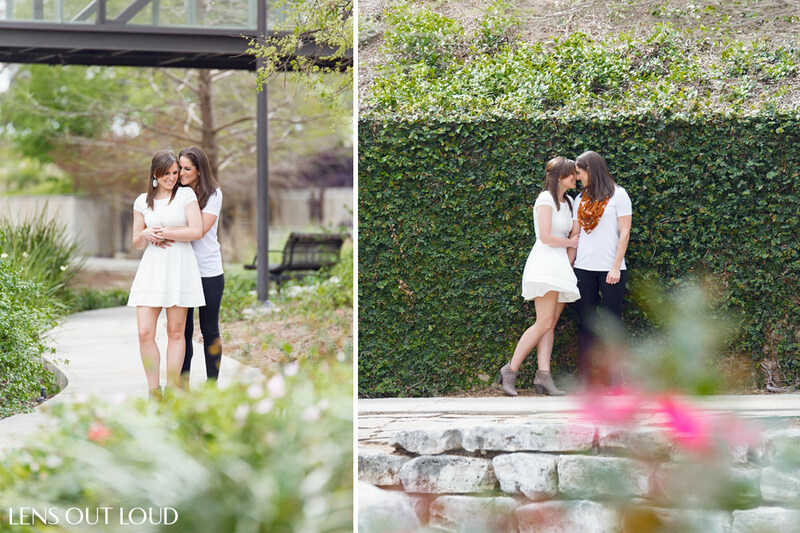 These two love birds are Traci and Laura. Enjoy! Location Style: Upscale estate grounds with Spanish colonial-revival architecture. 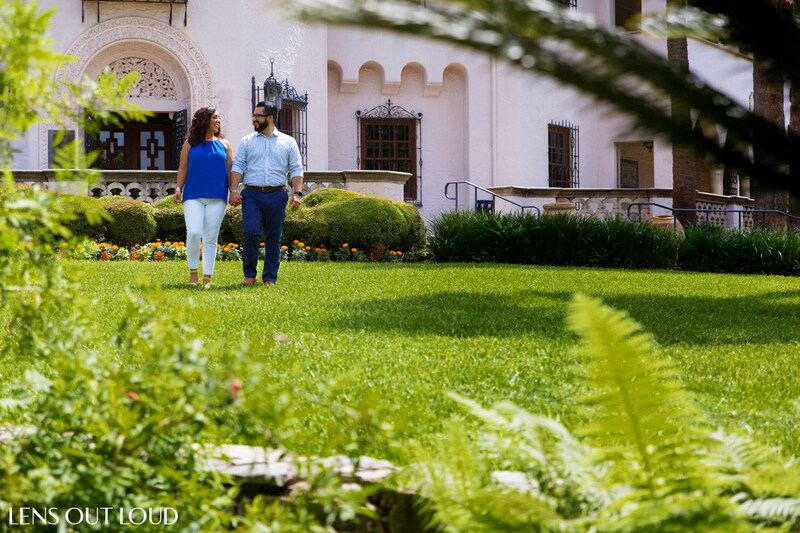 The McNay Art Museum‘s variety and the always well manicured grounds makes it one of the most popular engagement photo locations in San Antonio. 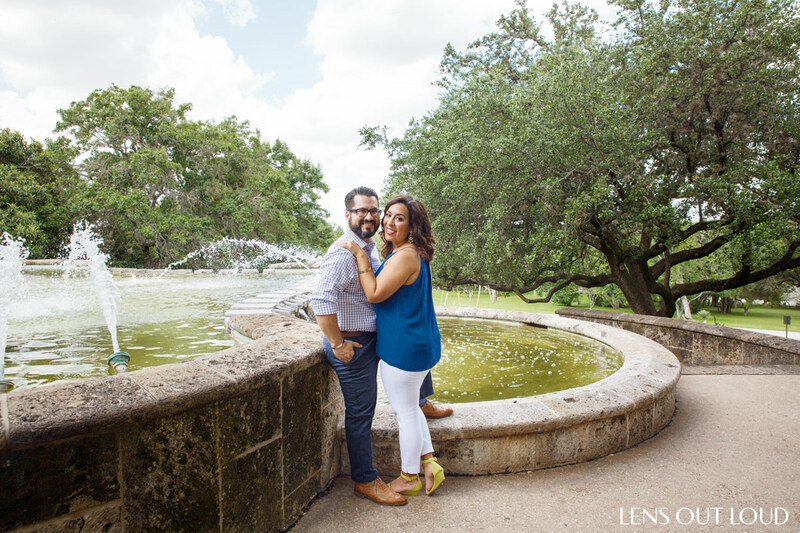 The grounds at the McNay features beautiful art structures, lush manicured landscaping & oak trees, rustic gazebo, Spanish colonial-revival mansion, coy fish pond with bridge, tall oak trees, gorgeous fountain. And if you time your session just right, you can catch the sunset falling onto the center the fountain. 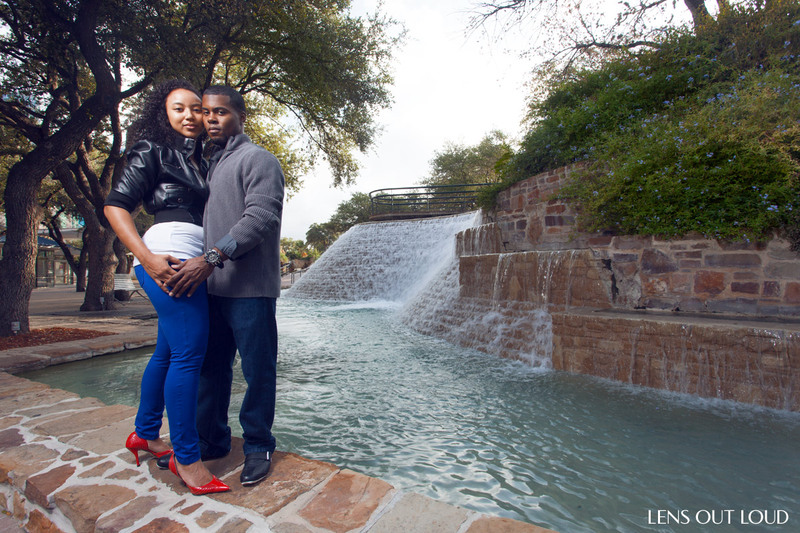 Here are a few images from one of many McNay engagement portrait sessions. These two love birds are Steve and Cori. Enjoy! Location Style: Prestigious and Distinct. 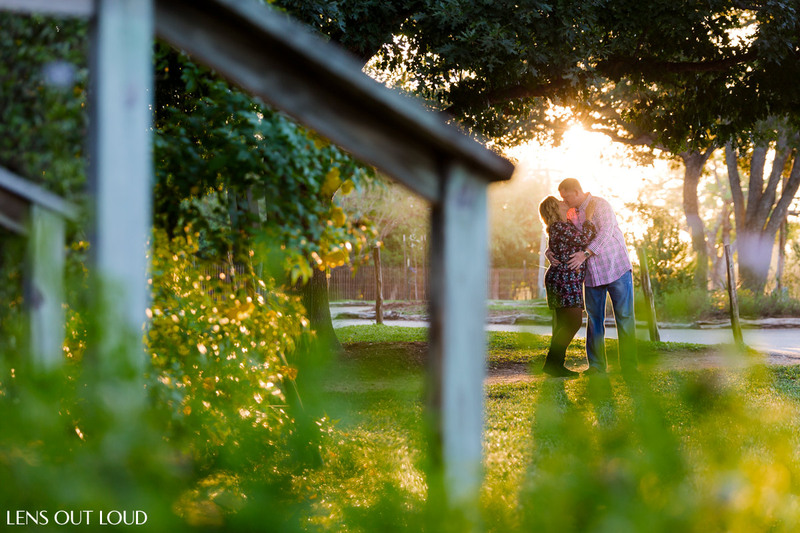 Settled by wealthy German merchants in the late 1800s, San Antonio’s first suburb consists of 25 blocks of historic well-preserved mansions set amid lovely landscaping- making it unique when compared to other engagement photo locations in San Antonio. The King William District rests on the south bank of the San Antonio River. While taking a stroll on the sidewalks you can have gorgeous mansions in the background. 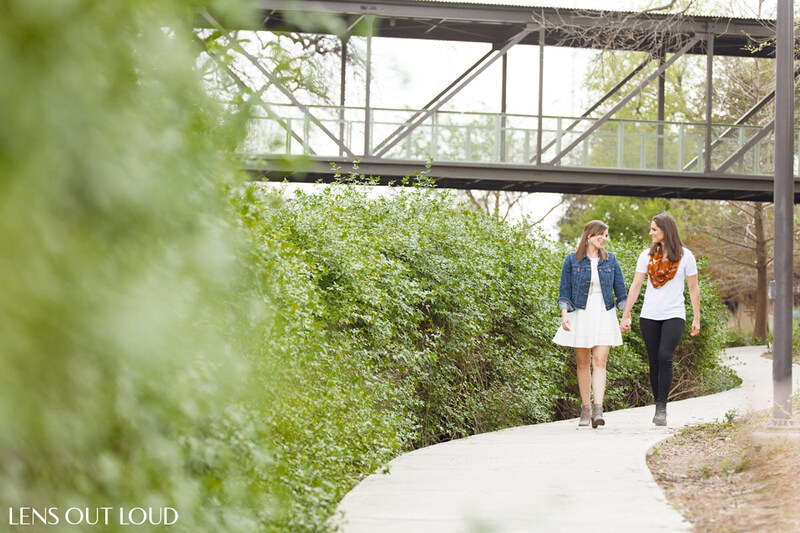 You can walk along the river walk after you visit the bridge and take a stroll through the King William Art District. You can’t go wrong! 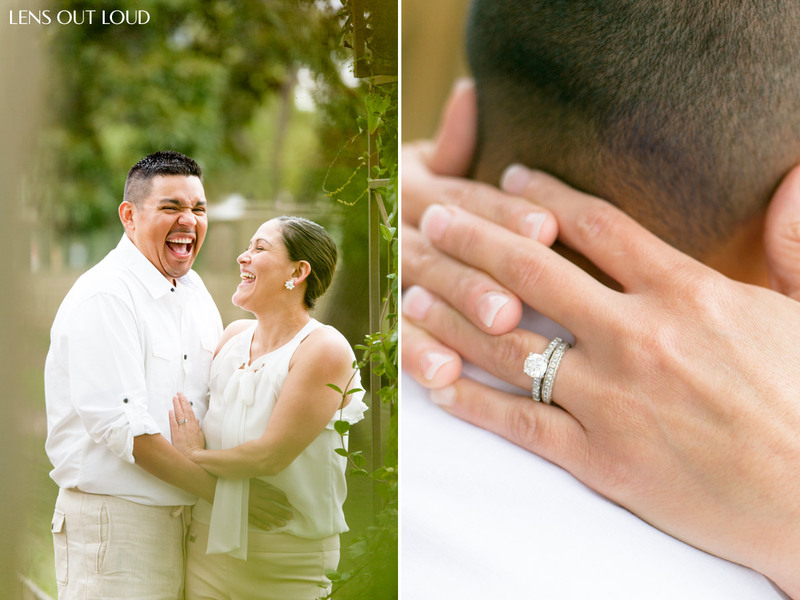 Here are a few images from one of many engagement portrait sessions we’ve photographed in the King William District. 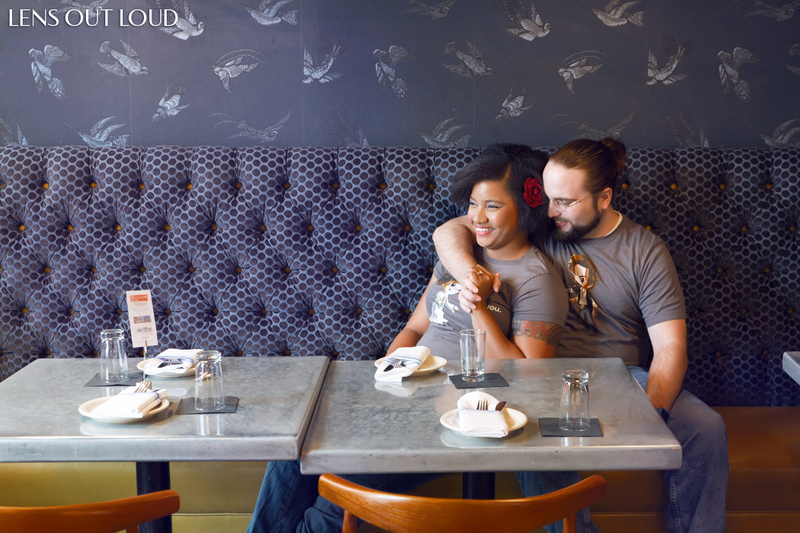 These two love birds are Alexandria and Stephane. Enjoy! 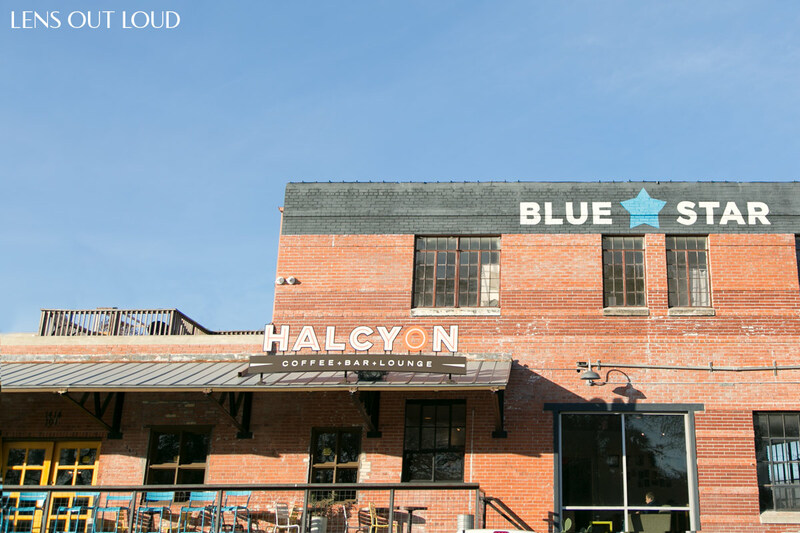 The Blue Star Art Complex is known as the Anchor of San Antonio Art and it features excellent curated places to live, casual hang out eateries, and creative art. The Blue Star Art Complex also rests on the south end of the San Antonio river. 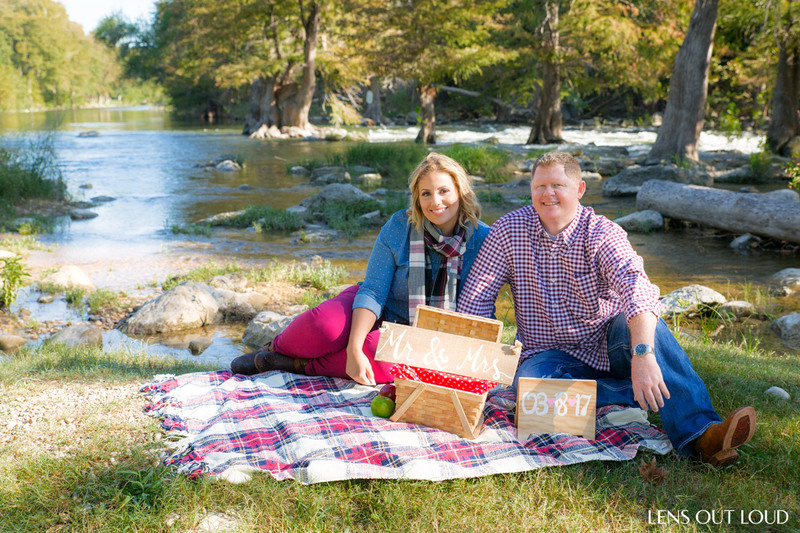 The entire area creates the perfect atmosphere for a fun loving engagement portrait session. Have some ice cream at South Alamode Gelato and then rent two bicycles to have some fun taking candid pictures while you venture the the Blue Star Art complex. 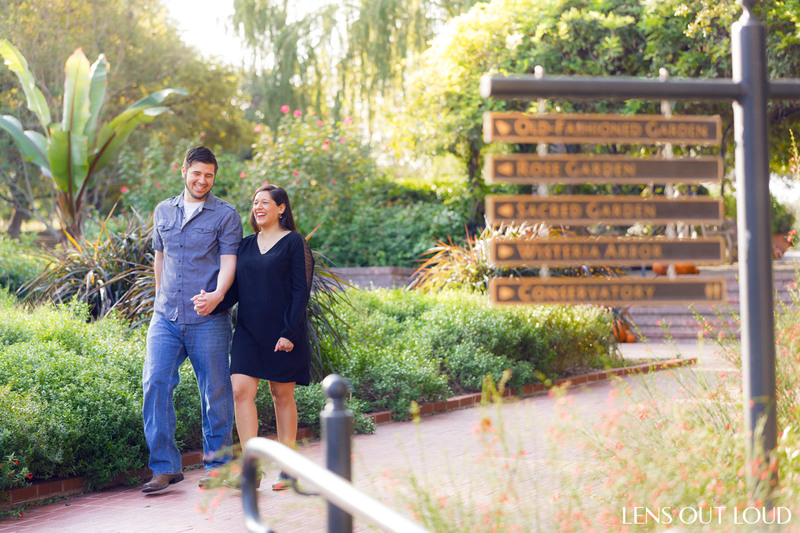 Here are a few images from one of many engagement portrait sessions we’ve photographed at the Blue Star. These two love birds are Kira and Robert. Enjoy! 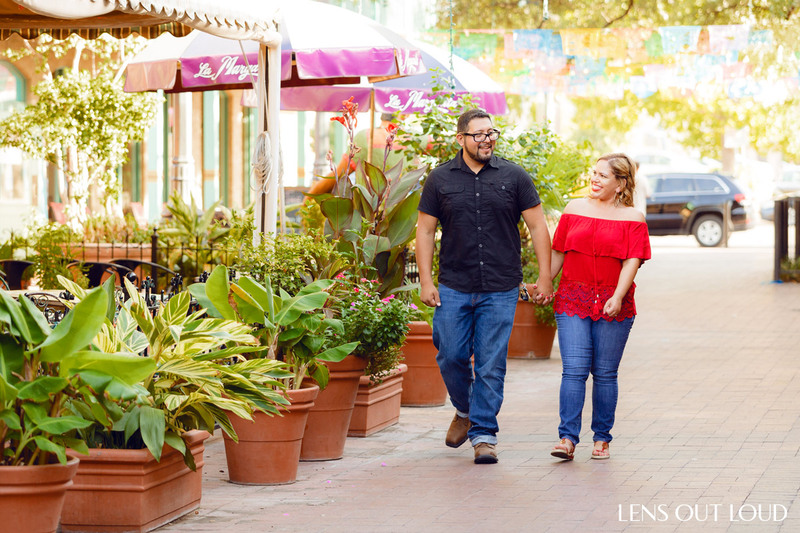 The Historic Market Square and Milam Park are the perfect pair of engagement photo locations in San Antonio. Why? Because the two locations are across the street from each other. 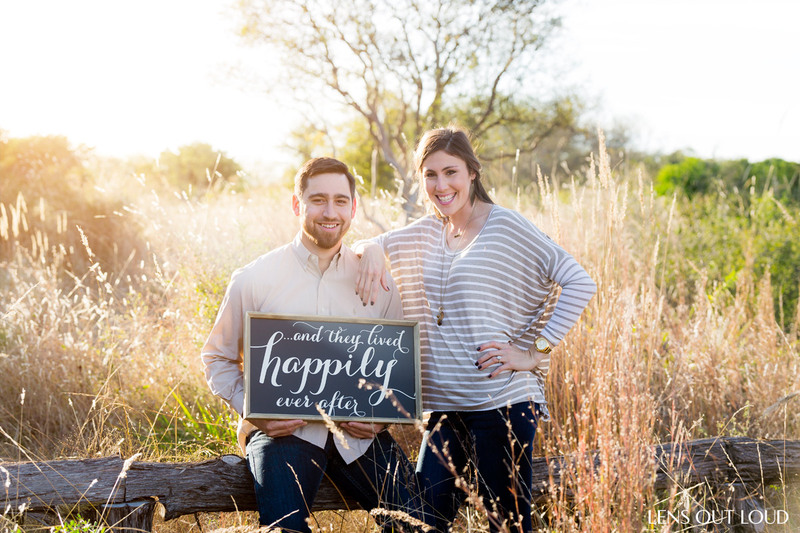 This means you can plan a multi-location engagement shoot with us that will have a variety of options in close proximity. 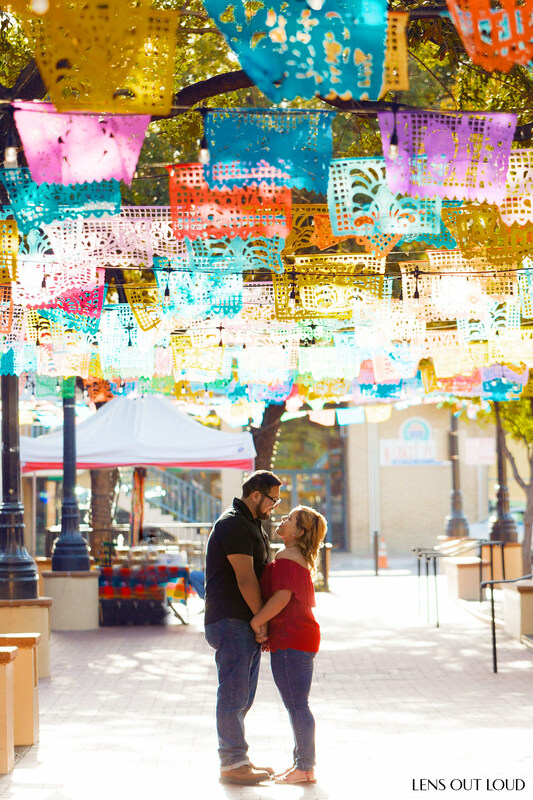 Market Square, the largest Mexican market in the USA, is hallmarked by it’s festive decor. 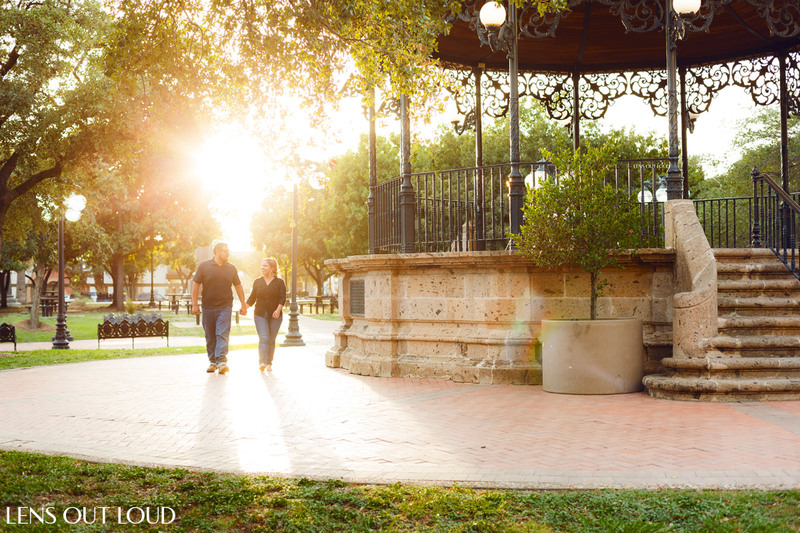 The historic Milam Park is beautiful- especially at sunset – and features a 26-foot copper-domed gazebo designed by Jalisco architect Salvador de Alba Martin with cast iron columns and railings atop a cantera base. 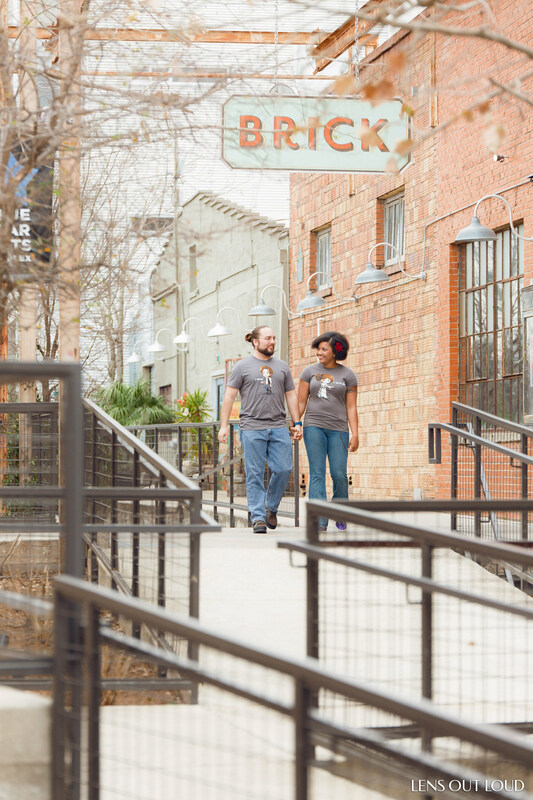 Take a hand-in-hand stroll through Market Square and have some drinks. Then skip across the street for a change of scenery at Milam Park. 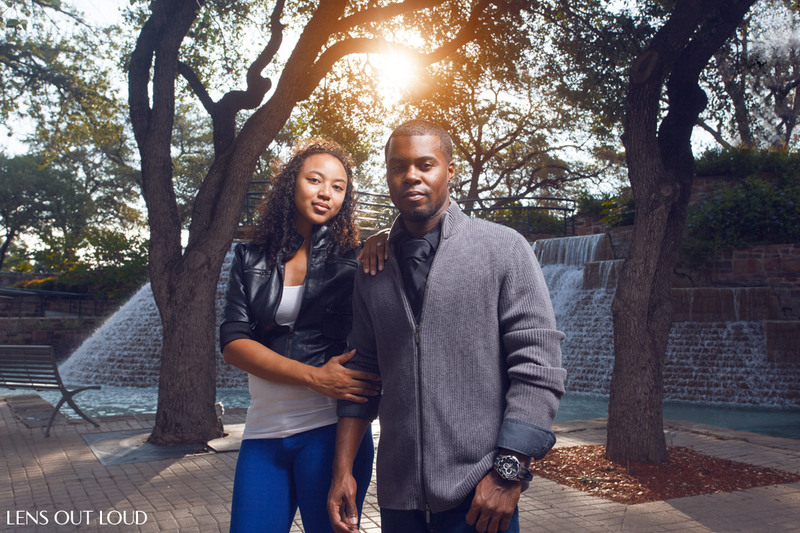 Here are a few images from one of many engagement portrait sessions we’ve photographed at Market Square and Milam Park. 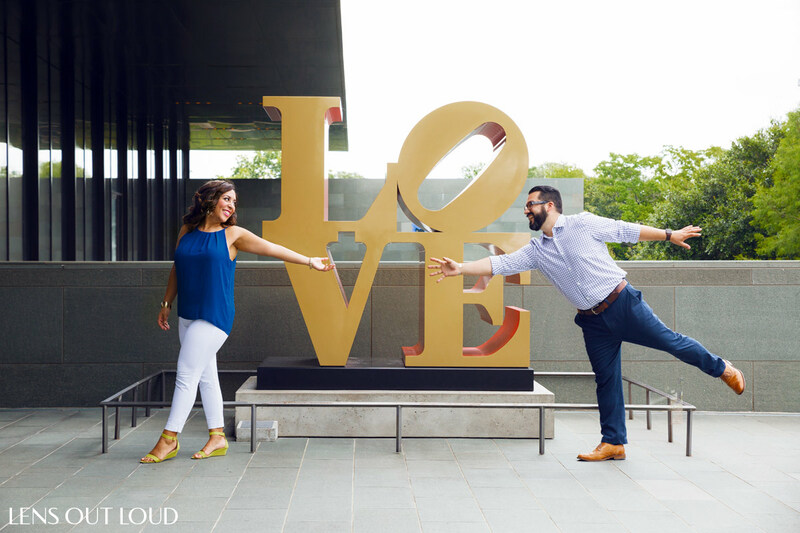 These two love birds are Jessica and Aldaberto. Enjoy! 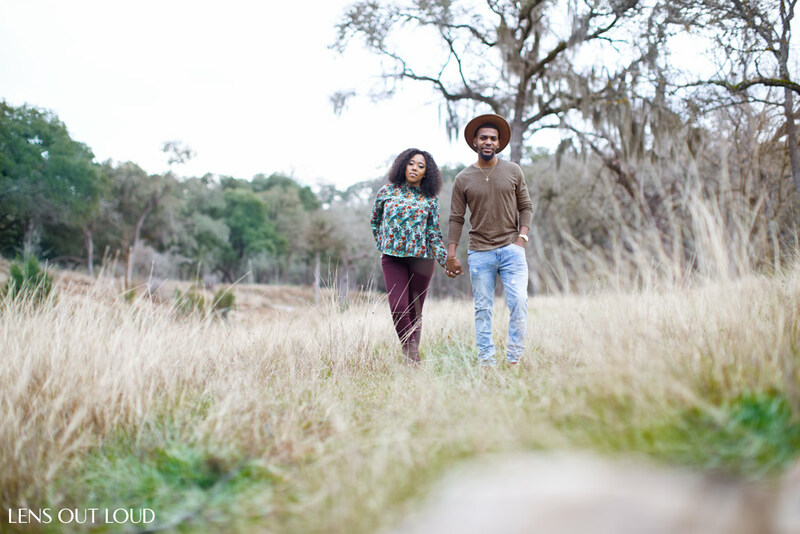 Phil Hardberger Park (PHP) is known as “the best place in the heart of San Antonio to see and feel the wild.” PHP features centuries-old oaks that and acres of sweeping grasslands. Sunrise or sunset kisses the grasslands making them glow with golden flare. If you want an outdoorsy, rustic feel that connects your love to nature, PHP is the place for you! 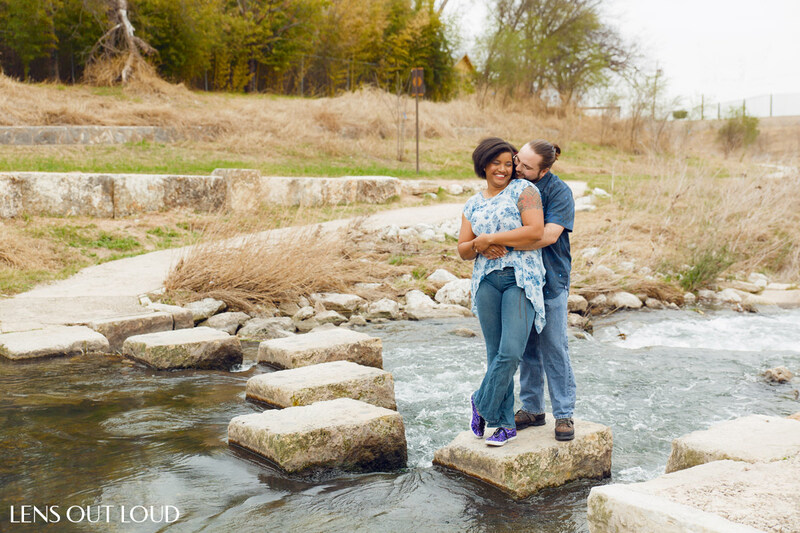 Here are a few images from one of many engagement portrait sessions we’ve photographed at Phil Hardberger Park. These two love birds are Alejandra and Cody. Enjoy! 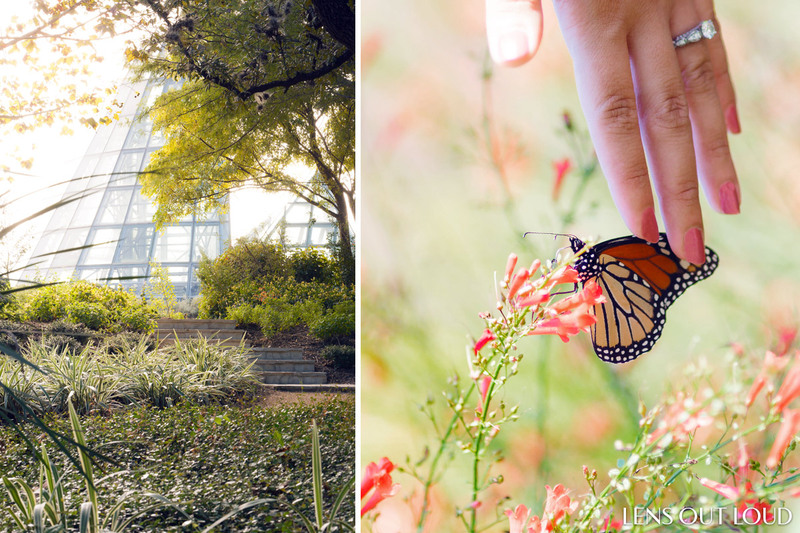 The San Antonio Botanical Garden is flat out gorgeous. 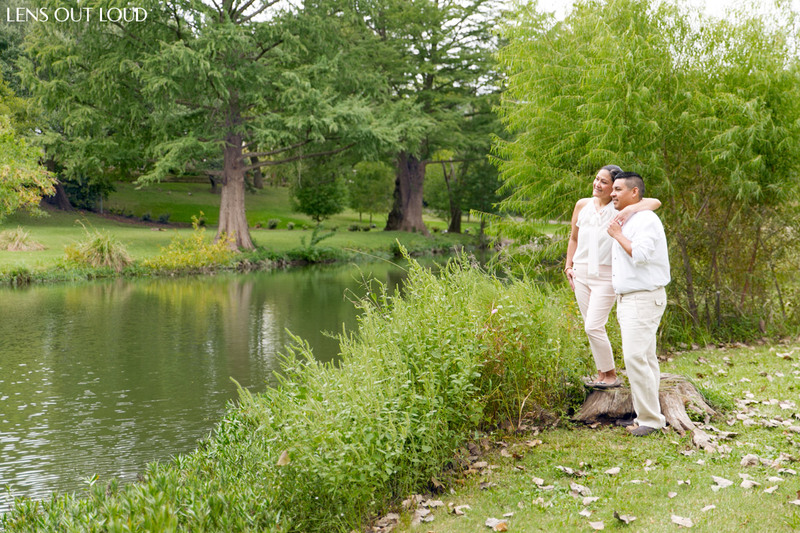 Flowers, well manicured grounds, stone fixtures, rolling landscapes and BUTTERFLIES galore are what makes the SABG a very unique option among engagement photo locations in San Antonio. 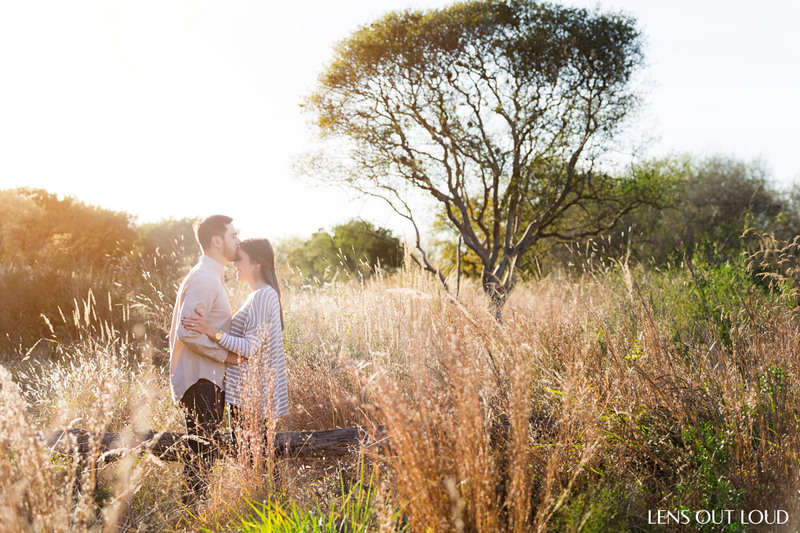 Here’s a tip: Schedule your engagement session with us early in the morning as possible when the SABG doors open. You will see the sun rays drench the entire scene and hopefully the butterflies will be flying about! 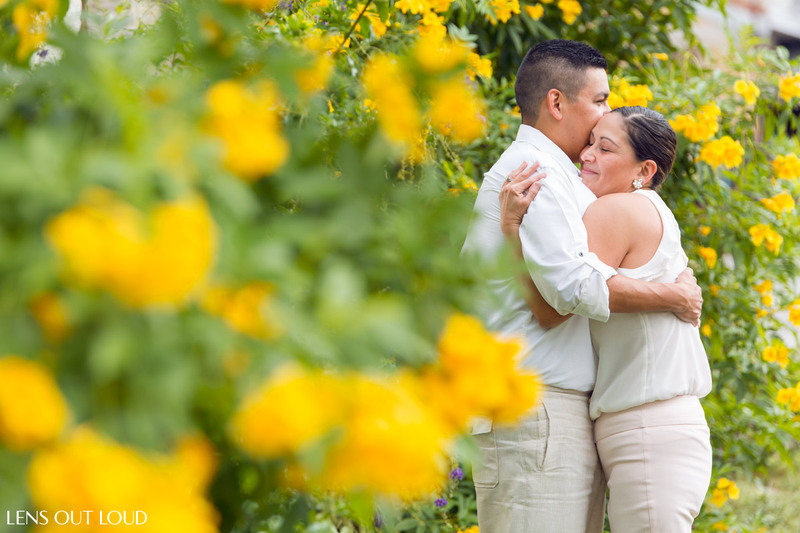 Here are a few images san antonio botanical gardens engagement photos we captured for our clients. These two love birds are Jospeh and Julie. Enjoy! The Hays Street Bridge has a rich history. As of today it is now a gathering place for passers by, joggers, pedestrians, bicyclists and tourists who all in some form or another enjoy the scenic views the Hays Street Bridge elevates their eyes to see. 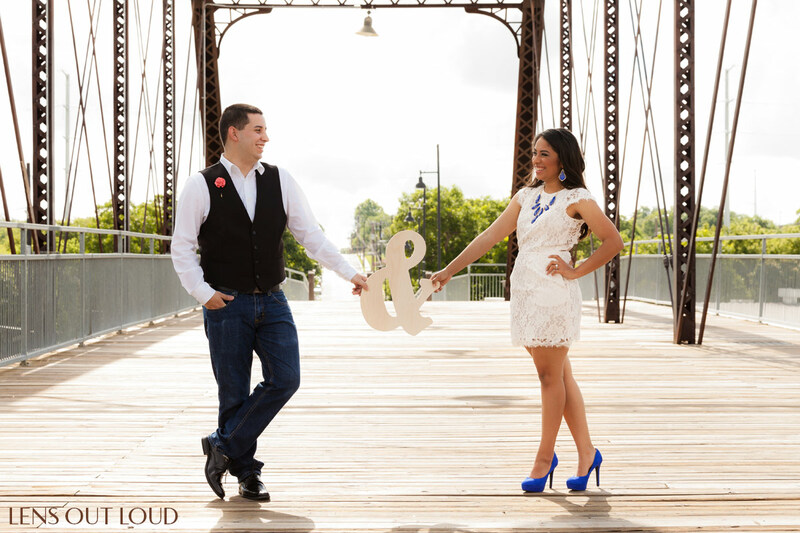 Located near downtown San Antonio, the Hays Street Bridge is the perfect location for carefree engagement portraits with scenic views of downtown San Antonio. 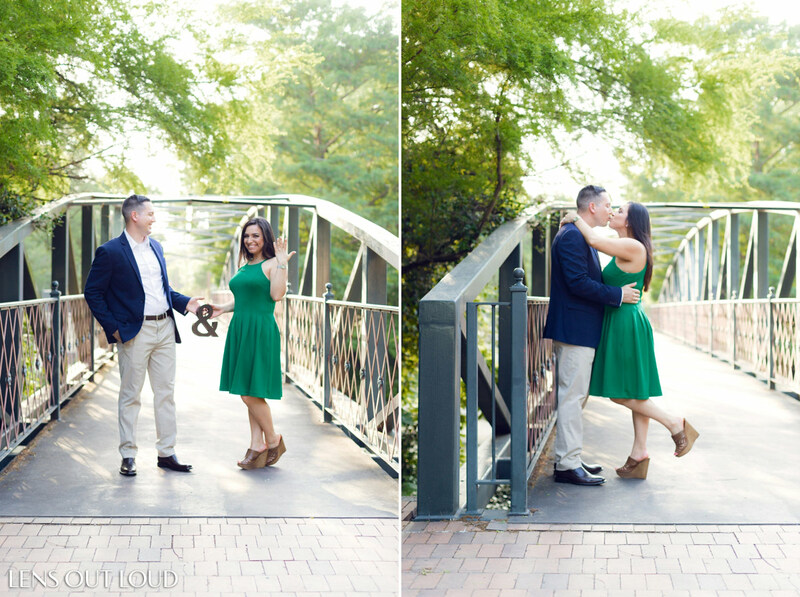 Here are a few Hays Street Bridge engagement photos we captured for our clients. These two love birds are Danielle and Adam. Enjoy! Cibolo Creek is a south central Texas creek that runs through Boerne, Tx. Though this location is not in San Antonio, Boerne is close enough to the Alamo City to make the list. The Creek Restaurant sits on probably the most popular stretch of the Cibolo Creek in Boerne. This area features gorgeously matured trees and creek shores that invite you to jump in. But please don’t- of course lol. 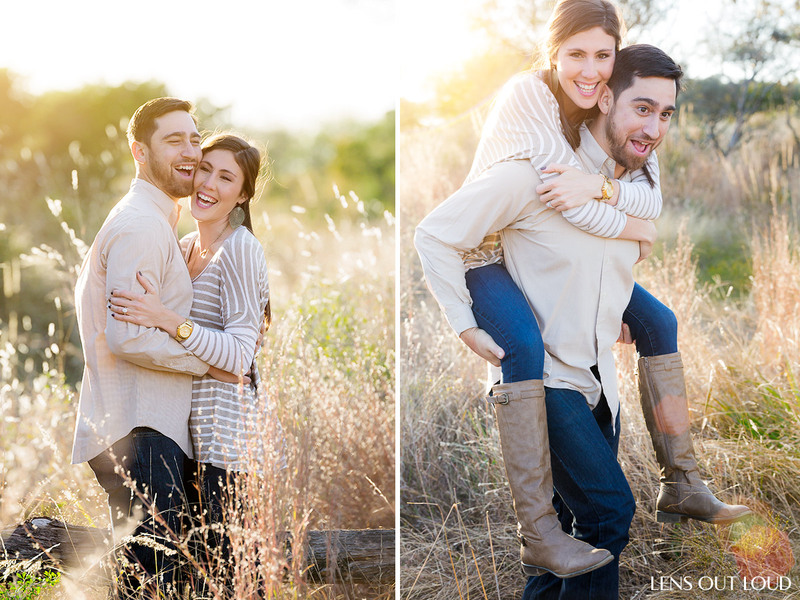 Here are a few engagement photos we captured for our clients Jacob and Yvonne and Cibolo Creek in Boerne. Enjoy! Hemifair Park is amazing. It’s super well known to the locals as the waterfall park that sits at the foot of the Tower of the Americas facing the back of the Henry B. Gonzalez center. The Hemisfair park is well known for it’s brick step waterfalls. These waterfalls create a gorgeous background. We recommend getting there early to beat the crowd. 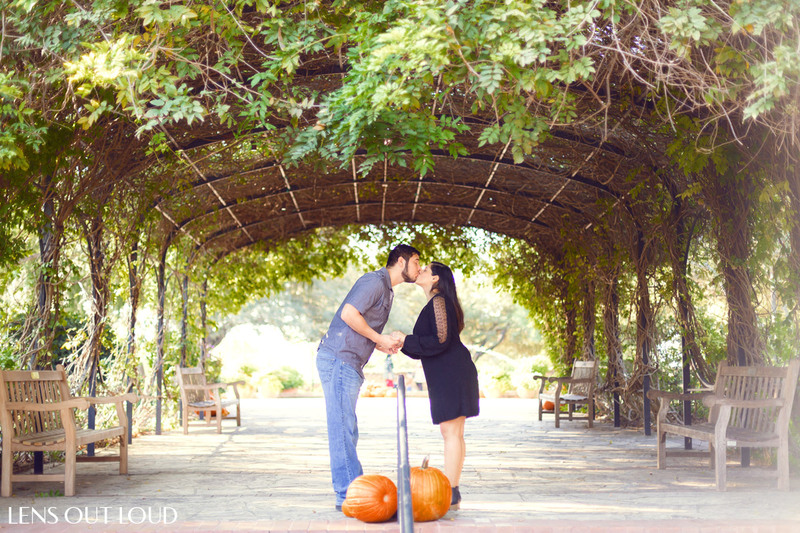 It’s a no brainer why it is a great option for engagement photo locations in San Antonio. 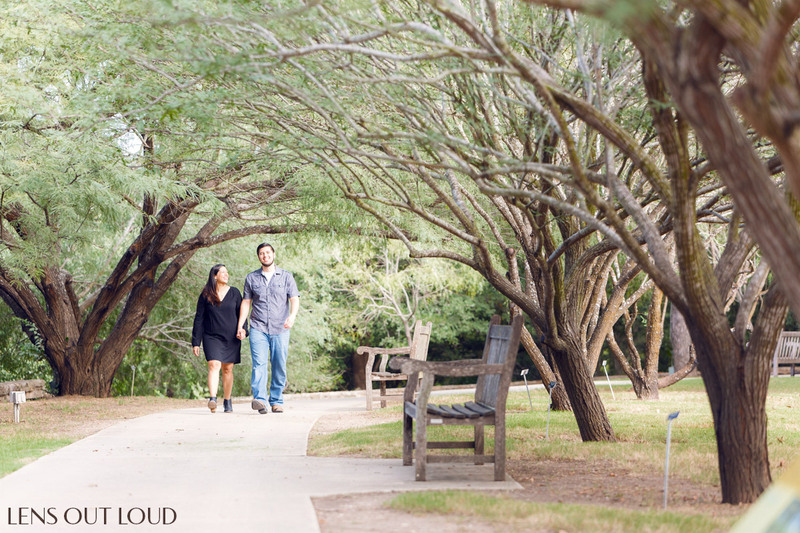 Here are a couple of engagement photos we captured for our clients Shirl and Alex at Hemisfair Park. Enjoy! 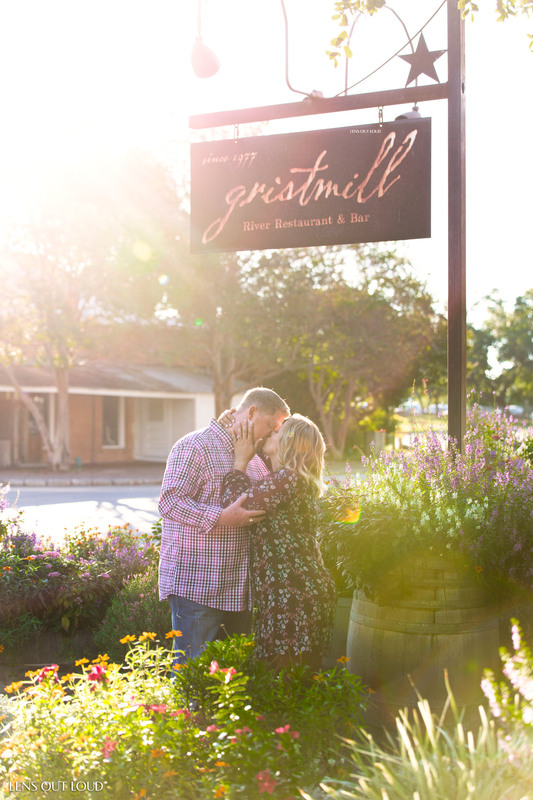 Although Gruene, Tx is an hour away from the Alamo City, we still list it among engagement photo locations in San Antonio… based on sheer popularity, lol. Gruene is 100% rustic. The historic district features historic buildings with beautifully aged wood, old -timey themed signage and lush greenery. And last but not least, the Guadalupe River flows through Gruene. 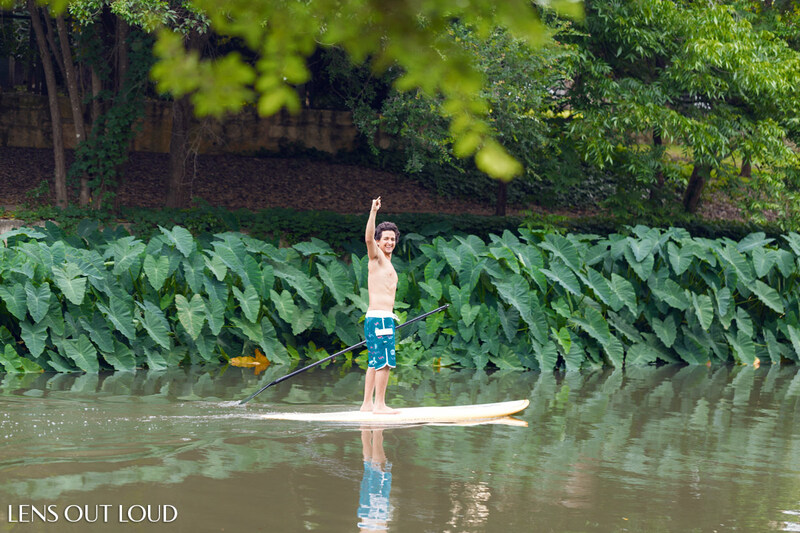 So prepare to roll up your pant legs and step into the low end of the river and take some super fun portraits. 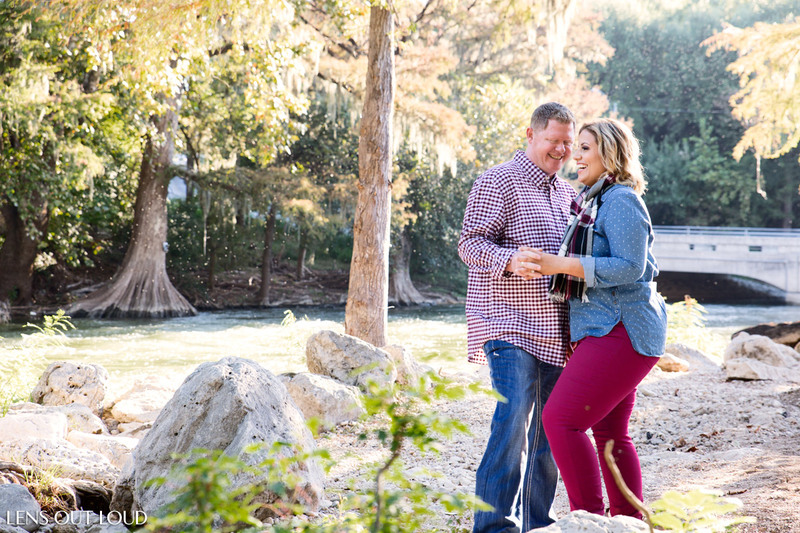 Here are a few of engagement photos we captured for our clients Maree and Larry in Gruene, Tx and at the Guadalupe River. Enjoy! 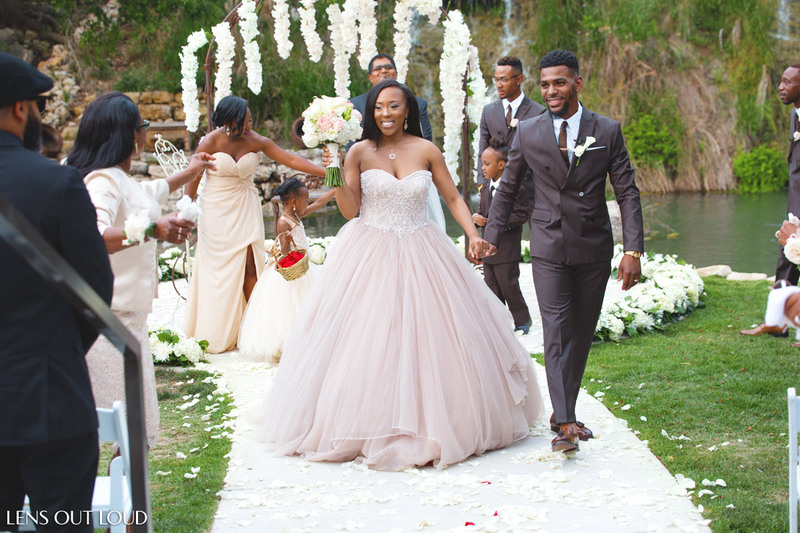 Consider using the grounds of your ceremony and reception venues. For example, meet David & Paris. They were married at Remi’s Ridge at Hidden Falls, formally known as The Lodge at Bridal Veil Falls. 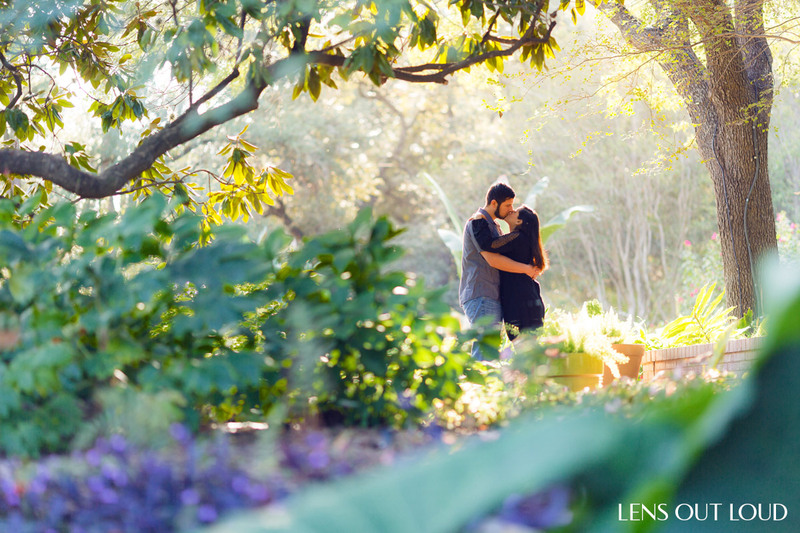 They loved the grounds at their venue so much that they decided to photograph their engagement session there. 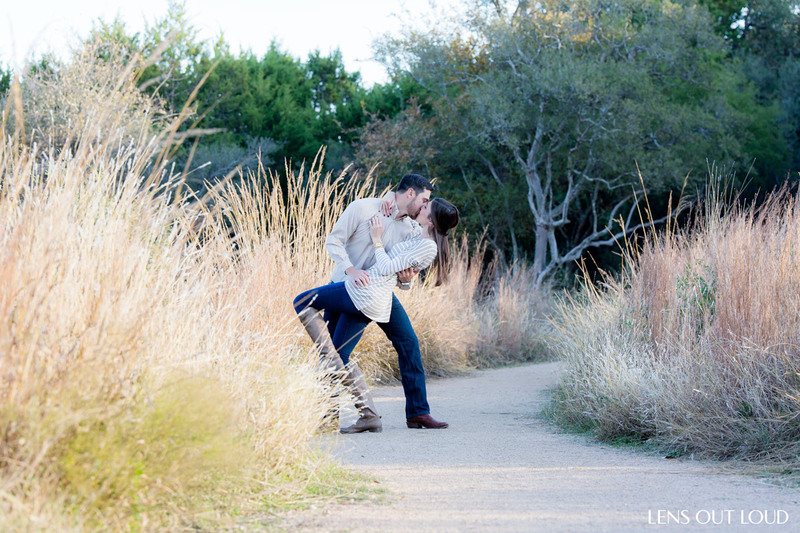 The session was gorgeous! 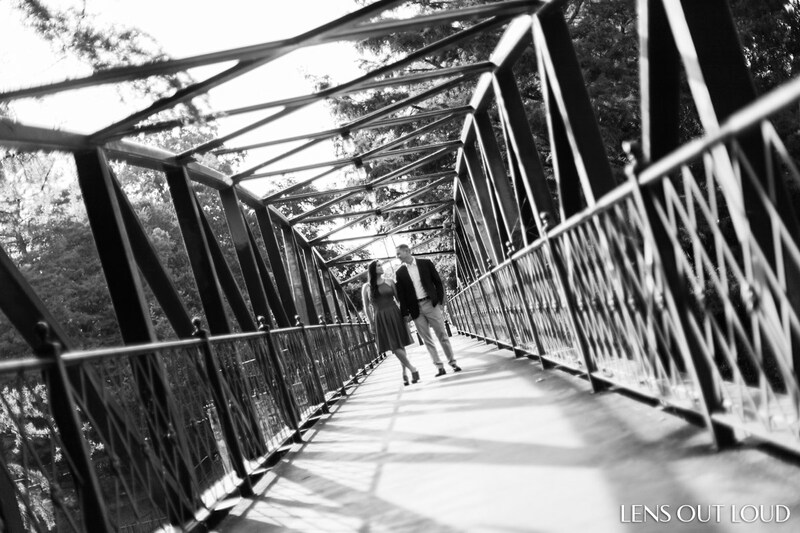 Here is an image from David and Paris’ wedding and a few of the images from their engagement session. Enjoy! 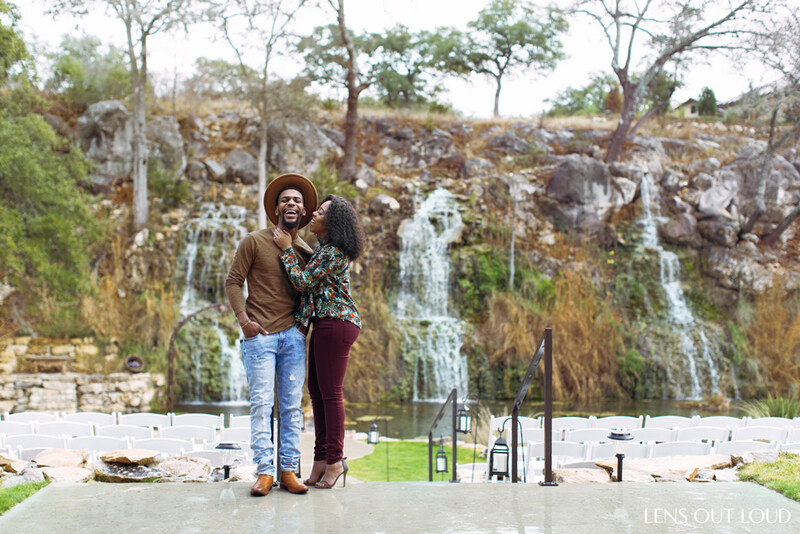 Click the links below to view these beautiful engagement photo locations in San Antonio on Google Maps.